BOTTOM LINE: In this poignant modern mythology, playwright Gary Owen spins a tale of loss and sacrifice in Splott and sheds new light on an ancient heroine. The Iphigenia myth goes like this: a young girl gets sacrificed in a game of power and lust to a fate worse than that of the piteous bird in the Juniper Tree. Duped into marrying Achilles, she is kidnapped at her wedding and then most likely murdered by her own father Agamemnon for the Greek fleet’s safe sailing. (Of course, early male voices painted this as Agamemnon's sacrifice). Some say Artemis saved her from her doom; others say it was Athena. While the facts are muddled one thing is clear: Iphigenia has intrigued us for centuries. She was the accidental savior, an innocent victim, and was sometimes called a saint. But I’m sure she would’ve preferred some more ordinary days, even in the cursed house of Atreus. Well she didn’t have a choice. And neither did Effie of Splott. In Gary Owen’s ingeniously contemporary adaptation of the Iphigenia myth, the heroine is Effie (Sophie Melville), a Welsh slacker who swims through her alcohol-drenched life in Splott. The language of the play is deliciously raucous and the story flows through your veins like jolts of electricity. Fluorescent light bulbs outline a broken window behind Effie as we meet her in leopard-print tights and a grey hoodie. She’s on edge: life in dilapidated Splott doesn’t have much to offer, and she’s got the attitude that says “zero Fs given” along with the air that simultaneously encapsulates a confident, highly sexualized goddess and a scared little girl thrown into the world alone. Effie lives a day-to-day life, and is having an unusually sober Monday when everything changes: she meets, and quite possibly falls in love for the first time, with Lee, a one-legged soldier. The mutual connection turns out to be a sham and the soldier (happily married no less) disappears from her life before Effie realizes that she’s with his child. Although presenting herself as a selfish being with a tough-as-nails exterior, Effie’s characters become exposed throughout the play, rough skin peeled off and sliced up like an orange, and her vulnerabilities become exponentially more apparent as she faces one life-shattering decision after another, making the “righteous” choice for the good of others rather than the “right” choice for herself. Melville’s portrayal of Effie is perfection. She brings the character to life in a way that’s at once mystifying and shockingly familiar: she is the everywoman who you avoid eye contact with because you see her holding her hands as fists and know there is insurmountable pain. She is your neighbor down the hall who you’ve barely spoken a word with, but your one brief encounter makes you wonder—what kind of past lights up that fire in a young girl’s eyes? With electrifying presence, she enters your heart like a soft arrow; she’s fried ice cream, burning your inside if you’re not careful, yet also leaving you a taste of sweetness. There’s elegance in the thoroughly measured simplicity director Rachel O’Riordan employs for this production. The design team (Hayley Grindle, along with Rachel Mortimer’s lighting and Sam Jones’ sound) understands that less is more. It’s a lean production without a single unnecessary stroke. With the entire set consisting solely of fluorescent light bulbs and a pair of chairs, much is left for the audiences to imagine, making the space infinitely versatile. The play also taps into important social issues in the voice of its lower-class heroine. The piece ends with Effie’s call for revolution: “What is gonna happen when we can’t take it anymore?” Her determination is pronounced. Set in the community of Splott, the piece is specific to the struggling region, but the problems such as the wealth gap and the societal pressures on the poor are painfully universal. 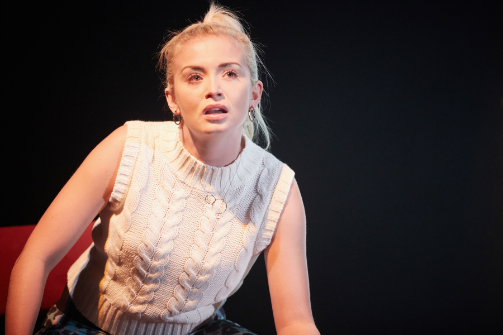 Iphigenia in Splott offers one of the most satisfying theatrical experiences around, with topnotch writing and an electrifying solo performer, and does so in a way that almost seems effortless. Iphigenia in Splott is by Gary Owen. Directed by Rachel O’Riordan. Production Design is by Hayley Grindle. Lighting Design is by Rachel Mortimer. Sound Design is by Sam Jones. Production Stage Manager is Veronica Aglow. The cast is Sophie Melville.